Qualified women are coming out of the education system and it is for the industries to hire, retain and promote them. As we are moving into the era of talentism, the integration of women into the talent pool becomes inevitable. It is also very important that women participate in policy making and political leadership. Carefully designed policies with dedicated leadership shall pave way to innovations and discoveries benefitting society. Renowned women scientists and women leaders from Government, academia and industry who are decision makers will be delivering lecture and participate in panel discussion. Till recently, leading newspaper of India reports that career in Science and Technologyis mainly occupied by men. Only 14% of Indian research is contributed by women. This is alarmingly low as compared to the global average of 28.4%. Only 65% of Indian woman receives basic education. This is threatening. We have a glorious past of legendary and intellectual women. We need to reinvent ourselves. Our father of nation, Mahatma Gandhi stated, “When a man is educated an individual is educated; when a woman is educated a family and a country are educated”. This was his vision seventy years ago. As a woman it should be our prime responsibility to take his mission forward.We are honoured to invite you to participate in 8th Women Science Congress (WSC), an integral part of 106th Indian Science Congress (ISC). Feel proud of yourself and contribute to this memorable event! Showcase and celebrate your scientific temper! Last date for abstract submission: 15th November 2018. Note: Only selected Abstracts will be called for poster presentation. Abstract book will be published. 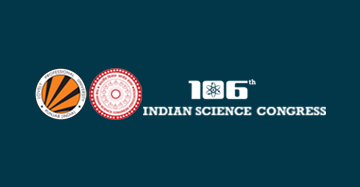 Women’s Science Congress in 106th Indian Science Congress will be organized on January 5th and 6th, 2019. Click Here to view the list of accepted abstracts .